Susan Ratchford, Michael Purcell, Hazel Leatherbarrow and Jeanette Alcker are four UNISON health members who are on strike today. More than 500 UNISON members are in dispute with Wrightington, Wigan and Leigh NHS Trust over the outsourcing of their jobs to a ‘wholly owned subsidiary’. At last week’s UNISON conference, they chatted to Sara Gorton, UNISON’s head of health, about why they’re going on strike, their passion for the NHS and their determination to protect our health service from privatisation by the back door. Sara Gorton: Tell me about what has happened in your trust. Susan Ratchford: The trust underestimated the strength of staff’s feeling about their jobs being transferred out of the NHS. Staff want to remain in the NHS. They believe it to be a family and they want to protect the NHS for future generations. They feel they are being separated from that. Sara Gorton: But your employer is acknowledged as a good employer – they win awards. And the services that are currently under threat are services that have won countless awards. Hazel Leatherbarrow: Yes, we’ve won cleanest hospital for four years running. Sara Gorton: And catering services have won awards too. How do people feel about working at Wrightington, Wigan and Leigh? Susan Ratchford: People feel so passionate about working for the NHS. They’re long serving staff. People who didn’t enjoy their job wouldn’t stay somewhere for so long. It’s truly a passion for them. Hazel Leatherbarrow: I’ve just got my 20-year service award and I am proud to work for the NHS. Sara Gorton: What are people worried about when they’re faced with being moved out of direct NHS employment? Michael Purcell: Although they’ve had promises from the trust about their terms andconditions, their biggest concern is the uncertainty in the long term and what happens when this current trust board moves on. They want the identity of working in the NHS. A cleaner said to me they would not do their job working for a private company – they do it because they work for the NHS. They have that sense of pride and they know they contribute to patient care. Susan Ratchford:Can you explain what members have done and what’s planned? And how many people are affected? Hazel Leatherbarrow: We’ve had four strike days so far and we’ve got action planned for five more days, starting on 28 June. 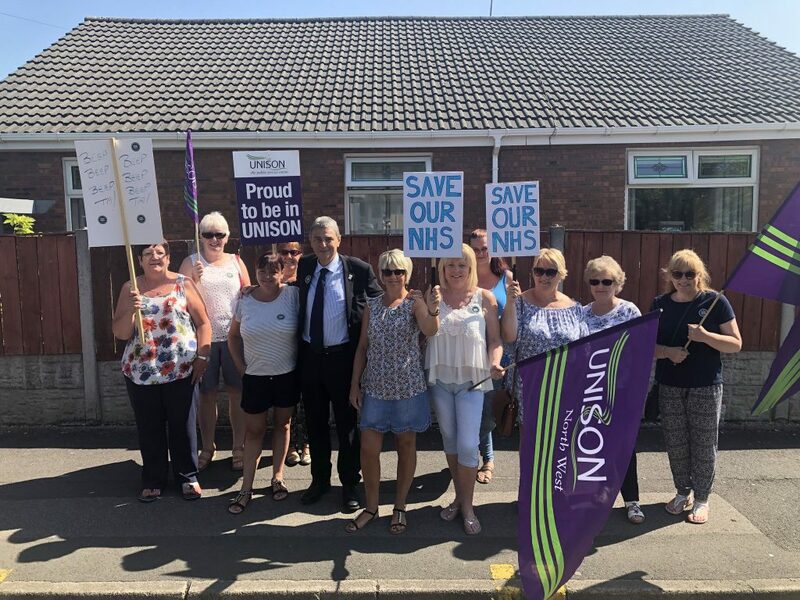 General secretary Dave Prentis joined WWL members on the picket line this morning (28 June). Susan Ratchford: 900 staff could potentially be transferred across and well over 500 are UNISON members. Sara Gorton: Tell me about how this feels. You’re not a branch that’s been in dispute with your employer before, are you? Jeanette Alcker: Really upsetting. The communication with the chief executive is usually really good – it’s a family, so this has come as a complete shock. Sara Gorton: What are you wanting to achieve with this industrial action? Hazel Leatherbarrow: We want to stay in the NHS. Not just for ourselves, but for future generations. Jeanette Alcker: Also, we want to be part of the solution and we’ve proven we can be useful in helping the managers achieve some of their cost savings. I’m a housekeeper on the ward and we work closely with procurement – going through the different needles, syringes, all sorts – to see what’s cheaper. It’s something really simple, but it’s saved £5,000 just on the medicine ward. Just little things like that, we’re all taking note. And we all care – this is people’s jobs. It affects everyone. We’re all in it together. Susan Ratchford: We need to find a way forward. All staff would want to be involved in helping the trust save. The people who can make the changes are the people who do the jobs. More and more NHS trusts in England are seeking to set up arms-length companies, or ‘wholly owned subsidiaries’ to save money. One reason is to exploit a VAT loophole. But UNISON believes staff will be vulnerable to future attacks on their terms and conditions, and new staff may be employed on inferior terms. 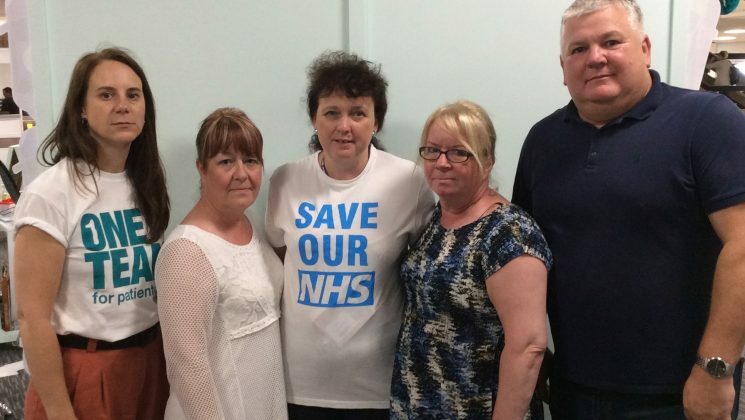 The five-day action from 28 June at Wrightington, Wigan and Leigh NHS Trust follows an 89% vote for strike action in a ballot which saw 73% of eligible members cast a vote. UNISON believes that the creation of wholly owned subsidiaries is NHS privatisation by the back door and we are stepping up our campaign against them.